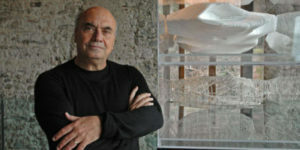 Italian architect, Massimiliano Fuksas is considered one of the most famous designer in Europe. He directs the Studio Fuksas with offices in Rome, Paris and Shenzen together with his wife. Among his famous work, the Twin Tower in Vienna and “La nuvola” in Rome. Who Is The Italian Architect? Massimiliano Fuksas was born in Rome on 9 January 1944, he is one of the best known Italian architects on the international scene. His father was a Lithuanian doctor of Jewish origin and his mother was a Catholic Italian of French and Austrian origins. After his father’s untimely death, he decided to move to Graz, Austria, to his maternal grandmother’s house. At the end of the ’50s he returned to Rome to attend high school, and in this period he got to know some of the most important exponents of Italian culture, among whom stand out characters like: Pasolini, Asor Rosa and Caproni. He also met the illustrious Giorgio De Chirico who invited him to work at his studio in Piazza di Spagna in Rome, making him passionate about art and encouraging him to enroll in the Faculty of Architecture of the University of Rome La Sapienza. He travels throughout Europe , managing to work also in the prestigious studio of Jørn Utzon. In 1969, he graduated from La Sapienza University, but already two years ago he opened his own studio, GRANMA, founded together with Anna Maria Sacconi. GRANMA’s success comes out of Italian borders. The Gym of the City of Paliano draws the attention of the international press for its slanted and detached facade and its system of seemingly unstable balances, both factors that upset the perception of users and allow the work to fit into the context of architecture postmodern. In 1988, he ended his collaboration with Anna Maria Sacconi and a year later he founded his studio in Paris, in 1993 that of Vienna and in 2002 that of Frankfurt, where he managed to work thanks to the precious help of his wife Doriana O. Mandrelli. During his career, he has received many international awards, among which stand out the Vitruvio Internacional a la Trayectoria (1998), the Grand Prix d’Architecture (1999) and the Honorary Fellowship of the American Institute of Architects (2002). In 2009, he designed the Armani stores in New York and Tokyo. In 2011, Fuksas was awarded the Ignazio Silone Prize for Culture. In 2012, his Rome studio “Massimiliano and Doriana Fuksas Design”, managed together with his wife, is the third in terms of turnover, after that of Antonio Citterio and Renzo Piano, with 8 million and 400 thousand euros. Fuksas’ works can be found all over the world: from the Twin Tower in Wien to the Roma Convention Center, better known as “La nuvola“, to the Armani Ginza Tower in Tokyo and The Milan Fair in Rho. 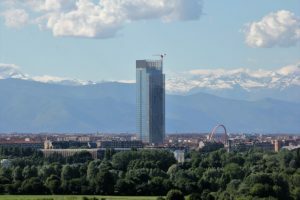 He designed also the Skyscraper of the Piedmont Region in Turin, which is the second tallest building in Italy. 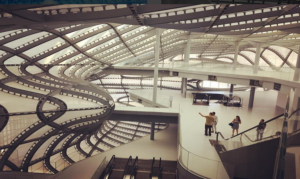 The New Conference Center or “Nuvola di Fuksas”, named in reference to the peculiar design of the auditorium inside the glass and steel “teca”, was inaugurated on October 29, 2016 in Rome. 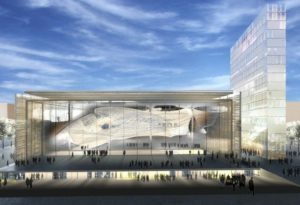 The new structure was created with the aim of becoming a state-of-the-art conference center with a very large capacity, one of the largest in Europe. The congress center can host 8,000 people, 2,000 of whom are only in the heart of the project, the so-called “Nuvola”. The congress hall has been designed with a modular structure: from a single room of 9000 square meters, multiple divisions can be obtained thanks to a system of mobile walls, up to a maximum of 24 rooms of different capacities. 1. 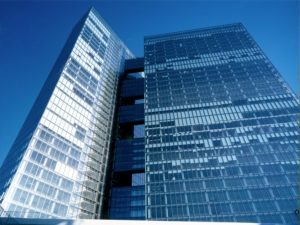 Teca: it is the main “box” of the building, a completely transparent parallelepiped made of steel and with a double glass façade. 2. Nuvola: it is the internal congress hall and the characterizing element of the project. La Nuvola is made of steel then covered with a semi-transparent fabric of micro-perforated glass fiber that guarantees the “cloud” effect. Inside, the auditorium is covered with black wooden panels that guarantee perfect acoustics to the room. 3. 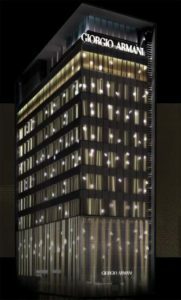 Lama: it is the hotel next to the real congress center, designed as a completely independent structure. The Twin Towers were designed by the Italian architect between 1996 and 2001. 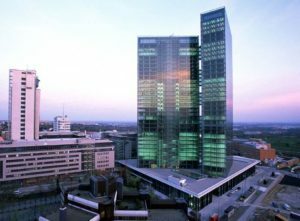 They are situated in an area of transition between the city and green areas, they are two huge glass columns. The transparency of the two blocks is the backbone of design and physically acts as a filter for connections such as continuous movement to and from the city, internal movement from one side to the other of the complex and, ideally, as a continuum between nature and architecture, work and recreation. The towers are not exactly the same, but differ in width and height, and in the number of floors. Indeed, they have respectively 37 and 34 floors, house 2500 first class offices and each floor is spread over an area of 1400 sq.m. The two buildings welcome those who arrive in Vienna from the South. Two light giants, 138 and 127 meter high. They are “light” because they are put into two huge transparent glass walls, with outlines that cannot be distinguished. They aren’t parallel nor perpendicular, but put obliquely to one another. The towers are connected to each other by five multi-storey bridges that contribute to create an extremely decisive effect that characterizes the entire panorama of the city, adding a new vitality to its image with the sight of the two towers, which are never static and immobile, sometimes completely visible and sometimes only partially visible, sometimes simple shadows that loom over the city’s landscape. Massimiliano Fuksas transforms urban space, adding and exalting a series of points that have always been at the center of his work: the development of the city and its functions through a link between density and green areas, and above all contamination with architecture, and use of architecture as a way to connect function with emotion. 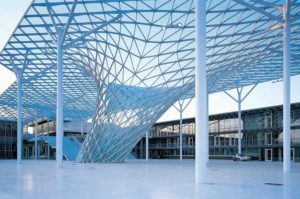 With undoubted skill, Massimiliano Fuksas lets himself filter the idea that success is just an ingredient of a personality who has sought other reasons in life. “From architecture, I learned that order matters as much as chaos.” Eclectic personality that does not easily compromise, in the last decade, Fuksas has also become a media personality, often interviewed by TV and newspapers for his projects but also for his political ideas, starting from the years when he was a protester at the University up to its current proximity to the left parties. Just this greater attention towards him has attracted criticism and praise in large quantities, to which must be added important commissions in Europe and beyond.